By the mid nineteenth century, anti-Catholicism had become a central conflict in America. Fueling the dissent were Protestant groups dedicated to maintaining what they understood to be the Christian vision and spirit of the "founding fathers." Afraid of the religious and moral impact of Catholics, they advocated for stricter laws in order to maintain the Protestant predominance of America. Of particular concern to some of these native-born citizens, or "nativists," were Roman Catholic immigrants whose increasing presence and perceived allegiance to the pope alarmed them. 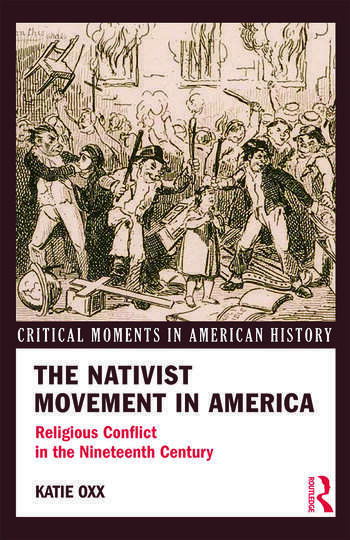 The Nativist Movement in American History draws attention to the religious dimensions of nativism. Concentrating on the mid-nineteenth century and examining the anti-Catholic violence that erupted along the East Coast, Katie Oxx historicizes the burning of an Ursuline convent in Charlestown, Massachusetts, the Bible Riots in Philadelphia, and the theft and destruction of the "Pope's Stone" in Washington, D.C. In a concise narrative, together with trial transcripts and newspaper articles, poems, and personal narratives, the author introduces the nativist movement to students, illuminating the history of exclusion and these formative clashes between religious groups. Chapter one, "Anti-Catholic Religious Nativism: A Critical Moment in American History"
Chapter two, "Convent Burning in Massachusetts"
Chapter three "Riots in Philadelphia,"
Chapter four, "The Pope’s Stone in Washington, DC"
Chapter five, "What We Learn from Religious Nativism,"
Katie Oxx is Assistant Professor of Religious Studies at Saint Joseph's University.